This past week I had the privilege of accompanying my boss to a breakfast roundtable on Russia hosted by a business association at the St. Regis Hotel. The discussion, with about 30 smart people representing some of America’s biggest corporations, was a stimulating one, and I swear I was paying close attention. But the highlight of the occasion was undoubtedly the food. The meal began with a salad of shredded canteloupe and honeydew. The main course was a superb and unusual eggs Benedict, which impressed me so much that I decided to replicate it at home for Sunday brunch today. This tower of delight is constructed on a foundation of a toasted English muffin and topped with a layer of smoked salmon, wilted spinach, and a poached egg, drizzled with Hollandaise sauce and sprinkled with snipped chives. I managed it in about 40 minutes and served it with sliced and sautéed polenta left over from last night’s dinner, with a French-press pot of freshly home-roasted coffee on the side. 1. Fill a wide saucepan or deep skillet with water, and add a teaspoon of salt and a teaspoon of vinegar. Heat it until it is barely bubbling. You will use this for the eggs later. 2. To make the Hollandaise sauce, put the 2 egg yolks, 1 1/2 Tbsp water, and a pinch of salt in a small saucepan over very low heat, and whisk constantly until light, foamy, and slightly thickened, about 3-5 minutes. (If the eggs begin to curdle, immediately remove from the heat and continue whisking for a minute before returning the pan to the stove. Add the butter, about a tablespoon at a time, and continue whisking until the mixture is thick and bright yellow. Add the lemon juice, then taste, adjusting the seasoning as desired. Cover and set aside while you prepare the other ingredients. 3. Place the still-moist spinach into a skillet over medium heat, and cover to steam it for about a minute. Stir as needed, then set aside. 4. Now for the eggs. Crack one egg into a small bowl or ramekin, and carefully slide it into the simmering water. Repeat with the other egg, being careful not to mix them. Poach for 3-5 minutes, until the white is just set, or longer if you prefer your yolk not to be runny. Remove the eggs with a slotted spoon and set aside. 5. 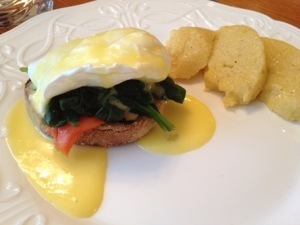 Place half of the English muffin on a serving plate, top with a slice of salmon, a spoonful of spinach, and one egg. Drizzle Hollandaise sauce over the egg, and sprinkle chives on top if desired. Enjoy! This entry was posted in Breakfast, Meals Remembered by Baron. Bookmark the permalink.